W. P. Kinsella passed away this weekend. Fittingly, we have selected his novel Shoeless Joe, the basis of the movie Field of Dreams, as our fiction selection for the baseball book club for October 2016. Featuring the characters who star in the film as well as additional personae and locations, it was a joy for me to reread this novel filled with examples of magical realism on and off of the baseball diamond. Although Kinsella hails from western Canada, at the time of this novel's publication he and his wife spent their summers driving through the United States to view America's pastime. He was a gem of a writer and a true fan of the game, and his love of baseball shines through the pages. The year is 1979. Ray Kinsella lives in a farm house outside of Iowa City with his wife Annie and their daughter Karin. One day he hears a voice telling him, "If you build it, he will come." Ray believes the voice refers to Shoeless Joe Jackson and the other eight members of the 1919 Chicago Black Sox scandal who had been banned from the game for life. Jackson was also the favorite player of Ray's father, and instead of being brought up with stories of nursery rhymes, Ray heard stories of Babe Ruth, Ty Cobb, and, of course, Shoeless Joe. Upon hearing the voice, Ray decides to plow under his corn and build a baseball field, deeming him crazy to all but his wife and daughter. After constructing a gleaming field and meeting Jackson, the voice speaks to Ray again, telling him to "Ease his pain." After wracking their brains, Ray and Annie realize that Ray must drive over 1000 miles and take reclusive author J. D. Salinger to a Red Sox game. Unlike the movie which skips directly to Boston, in this printed version Ray attends games in Chicago, Cleveland, Pittsburgh, and New York on his journey east. The scene in a Cleveland Greek diner contains magical symbolism that would have been enjoyable to see on screen but wouldn't have leant itself to the flow of the film. Frank and Wandalie the waitress were memorable characters all the same. The novel moves from Boston to Moonlight Graham in Chisolm, Minnesota and back to Iowa City. We meet Eddie Scissons the oldest living Chicago Cub and find out that Ray has a twin brother named Richard who has worked for a traveling circus for the past fifteen years. Both play pivotal roles in the book but were also kept out of the film version. Additionally, having attended college in Iowa City, I found the landmarks Kinsella the author mentions to be reminiscent of a simpler time, which is the imagery he created with his magical field. Kinsella ends with the same speech by Salinger that he recites on screen: "I don't have to tell you that the one constant through all the years has been baseball.." As a fan of the game, this soliloquy resonates to me as to why I eagerly await spring training each winter. Baseball is the one presence in many of our lives that gives us hope each spring and moves on cyclically through the years. W. P. Kinsella has penned what I feel is the definitive baseball novel. His field is magical for all who view it live as I have, in print, or on screen. It was a pure joy to reread and I look forward to revisiting Kinsella's other work as well. As always, 5 delightful stars. Find all of my reviews at: http://52bookminimum.blogspot.com/“Is this some kind of religion?”“It may be.”If you are a fan of America’s pastime, there’s a good chance you believe the same. My Sunday “church” is the Little League fields of flyover country and I couldn’t think of a better book to read on opening weekend . . . . Unless you’ve been living in a box (♫♪♫living in a cardboard box♫♪♫) you have probably heard of Shoeless Joe, at least in its movie format Field of Dreams. In case you haven’t, this is the story of Ray, an Iowa farmer who hears a mysterious voice one day telling him . . . . “If you build it, he will come.”Ray immediately knows what he needs to build and the “he” who will be coming. When he hears the voice a second . . . “Ease his pain” And then a third time . . . . “Go the distance.” He has an awareness of the next steps he needs to take as well in order to . . .“Fulfill the dream.” This is the quintessential story about the love of the game. . . .. It’s a story about faith and family and finding inner peace and it might just make you believe that a little cornfield in Iowa might really be heaven . . . . The film version is near perfection. I’m knocking off 1 Star here for the scene that was not included in the book, which was the one that made my robot heart melt and rain fall out of my face . . . Highly recommended to anyone who believes that: “I suppose that wouldn’t be a bad epitaph for me: ‘He was a fan of the game.’”Now PLAY BALL! Oh and to my beloved boys in blue . . .
Let me explain why I only gave this one star: although I didn't hate this book I did fail to finish it (I got about half way) and I always give only one star to any book that forces me to abandon it before the last page is read. I actually enjoyed bits of it, but in the end it was just too fractured, too American, too baseball and too surreal for me. English don't do baseball well but I have successfully read stories based on this sport before, so that alone wasn't a show stopper. I'm a self confessed Americanophile, so it wasn't just that. I'm alsoa big fan of Murakami so surreal, in itself, is fine. But the fragmentation and the combination of the elements I've mentioned, that's what did it for me. I loved the film Field of Dreams and I therefore assumed I'd feel similarly about the book that spawned the movie. I'd been fascinated by the story of Shoeless Joe since, many years ago, I bought an album by an English singer called Joe Jackson which featured a pair of shoes as the only image on its cover - it persuaded me to delve into the history of this famous baseball player, renowned for his hitting as well as (of course) the Black Sox Scandal.J D Salinger - who features strongly in this book, as a result of a imaginary meeting - wrote only one significant offering to literature, but it remains remains one of the few books I've read more than once. Surely, all this added up to this book being a perfect fit for me. Alas not. I just couldn't follow it, even though I knew where it was going I couldn't 'feel' where it was going. It didn't convince - on any level. And the depiction of Salinger was just weird. Does anyone feel this description of the famous writer rings true? Surely not. So, not one for me I'm afraid. I don't have enough words to say how much I loved this book. I've waited a long time to read it. It has never been the right time until this weekend. I know that sounds cryptic, but there was a reason. If you have ever watched the movie, Field of Dreams and love baseball, this book is a must read. Go buy it. "When you need it, it will be there." I promise, you will not be disappointed. The text is as magic as the story line. Kinsella's text can transport you. He can paint a masterpiece with words. They are sprinkled throughout the story, like crows in a field after it has been mowed. (My words, not his. )"April arrives, tender and personal as the breath of animals in a barn; snow shrinks from the sun. The fields puddle. The sun drinks away the standing water, and the land is ready for seeding. "My favorite:"Behind our house a hundred yards or so is a collapsed building, its unpainted wood aged to the softness of owl feathers... It was perhaps a granary or a henhouse once, but stood abandoned for years, until, as if nature had given it a gentle karate chop, the roof collapsed in the middle, sinking slowly downward like an old camel attempting to kneel. It rots with dignity into the earth. A window is now at ground level, and the strangle grass, bent by evening breezes, peers inside." Wow! I saw the movie years ago and I just picked this book up to have something to read at the beach. I was blown away. Kinsella has a beautiful way with language. As the cover says, this is not just a book about baseball. It is a book about love and memories, about the truth of our lives, and, in the end, like so many other great works, it is about fathers and sons and the heart rending distance between them that is filled with longing and love and the inability to express it. It left me in tears. October 2016 read with the Baseball Book ClubThis book, I discovered, is an extremely visceral one. It touches all of your senses as you read: you can feel the grass and dirt under your feet, smell the worn leather of a baseball glove, see the lights come on in the stadium, and barely make out Shoeless Joe as he walks toward you from that door by the cornfield. All just by reading. And what a read it was. Normally, a book this size (224 pages) I should've finished in two days. Took a bit longer than planned because a) real life and b) I really enjoyed taking my time and savoring it. I think the phrase 'magical realism' was invented to describe this book. If you haven't read it (or at least watched Field of Dreams), even if you're not a baseball or sports person, please give it a shot. It's such a beautiful story. It is so nice to read a book like this one.I admit that I approached it with apprehension. I had been wanting to read it for a very long time, but the movie Field of Dreams was already so beloved to me that I worried the book might somehow lessen its appeal in my eyes. This is not a book that is meant to be skimmed through for plot details, or main ideas. This book is meant to be savored. The prose reads like poetry and breeds fantasy and wonder. The author puts his reader right in the moment with present-tense, stream-of-consciousness-style narration. Even better, the narrator is an engaging one, whose language is filled with the wisdom of an old man, but the imagination and enthusiasm of an eternal child.While, yes, the language does seem overly flowery, or perhaps even too descriptive, I think it has a positive overall effect. I never felt that it took away from the beauty of the dreamy prose or the progression of the truly unique and compelling story. It is able to inspire emotion in its readers - fear, awe, reverence, anticipation, and even giddy excitement. For someone like me, who grew up with the movie, it is impossible not to hear Kevin Costner's voice as I read, and to see the imposing figure and hear the booming voice of James Earl Jones, despite the fact that I know it is the fictional version of J. D. Salinger I am meeting in these pages.More than anything else, I love the emphasis this book places on faith. It shows that idealism to the point of foolishness still exists, and can be rewarded. It provides hope for those of us who want to believe in the impossible without being disillusioned.I am thrilled to have read this book. "Baseball is a ceremony, a ritual, as surely as sacrificing a goat beneath the full moon is a ritual." Ray Kinsella speaking to J. D. Salinger at Fenway Park during a Red Sox game explaining or trying to at this point 84 pages into "Shoeless Joe" why he has driven over a thousand miles to sort of kidnap him and drag him to this game and, hopefully, find out what that voice means by 'ease his pain' - Salinger is noncommittal, skeptical and befuddled at these Quixotic circumstances that has him listening to this babbling baseball nut who seems rabid for his involvement. There's a ball diamond carved out of a cornfield back outside Iowa City, Iowa, where Ray as a small, struggling, one-section farmer and ex-life insurance salesman met a geezer on the street one day who claimed to be the oldest living ex-Chicago Cub turned farmer and who convinced Ray to rent then buy his farm. Ray's redheaded wife Annie and their daughter Karin are in on the magic that's been taking place out on the field as ballplayers from the 1919 Chicago White Sox appear out of center field led by "say it ain't so" Joe Jackson. They're ghosts of themselves playing the game they love for an audience of three, but that will change. "Field of Dreams" is a favorite for any baseball fan and being set in an Iowa cornfield just adds to the pleasure of us mid-westerner's who growing up in what seems like a never ending sea of corn usually thought only of boredom attached to that uniform green standing tasseled forever waves of grain. What I didn't know about the book was that Salinger was the writer character and that there was so much of the Chicago Cubs by way of Eddie Scissons (the geezer) wrapped up into the story. Even though my first baseball game was to Comisky Park in '64 where Mickey Mantle hit a home run I've mostly been a Cub's fan, and they last year after a hundred's year drought finally won the World Series and Chicago threw the biggest parade and celebration in it's history. But back to this book and these characters. Besides the players who just appear out of corn and Ray who with J. D. in tow and now buying into the celestial mission of sorts (think "Blues Bros") are "Moonlight Graham" another baseball ghost with unfinished business, Eddie Scissons, Annie/Karin, and well others who fill out the nuances of the conflict and final resolution of this magical realism lovefest for Americana as it was in a Rockwell painting. The movie did a fabulous job of bringing all this to life, but the book as it always does fills in the blanks and adds substance to the easy pleasure of the screen. Even a non baseball fan will get some schooling of the fervor and passion the game with its rich history provides against the bluster and pace of change in a world gone fast. It's a game simple enough for anyone to play but complex in getting good at. It's played on grass, on streets and just about anywhere you can scratch out a set of bases and outfield. Ray Kinsella is a loveable hero for having open soul to hear a call from beyond and the courage to follow his dreams and that unknown voice. His wife and daughter are hero's for loving boldly and supporting their shared belief. Doc Graham and Eddie Scissons are hero's for loving their dreams enough to let go and still be vibrant and contributing individuals. J. D. (Jerry) Salinger gets a chance to come out of hiding and become his own hero too and it was so good to have him back among us. So I'm awful biased in loving this book 'cause baseball and cornfields and Chicago Cubs/Sox and redheaded loving woman are parts of my own field of dreams which got played out for real with this magical game of a story! 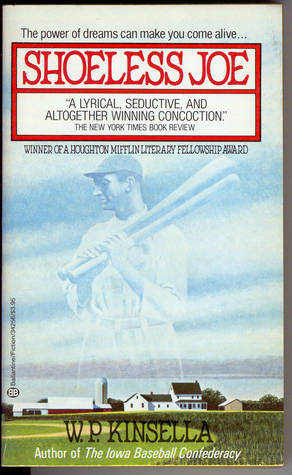 If you enjoyed the movie Field of Dreams, you owe it to yourself to read Shoeless Joe. What makes this book such a joy to read is Kinsella’s powers of description. He creates characters that you love or hate - sometimes both in the course of the story - but to whom you just can’t remain indifferent. His metaphors are common things employed in such uncommon literary ways that one hears, smells, and feels all that the characters do. These are the tools that Kinsella uses to frame his central message of striving for what we believe in and that is what makes this an important novel. The protagonist faces the potential loss of the physical means of achieving his dream as well as the scorn and ridicule of those who can’t or wont understand the importance of “silly” or impossible dreams in making us who we are. This is also a book about how vital those who believe in us are to our dream-chasing. I challenge any dreamer to not be in love with Annie by the end of the first chapter. I have a feeling I would've liked the movie better even if I'd read the book first. From a style standpoint, the author pumps out metaphors like a coke machine (IRONY ALERT!). He's in love with describing one thing as being like something else, which is fine when done sparingly. The story's great, though. Annie sounds like the most perfect woman/wife ever created by a writer, Canadian or otherwise. And I spent a fair amount of time wanting to punch J.D. Salinger, which seems about right given my previous experience with his "character's" work. Casting James Earl Jones as a reclusive counter-culture writer in the movie instead of Salinger was a great choice, IMO (as if casting Darth Vader is ever wrong). It's rare in my experience that a movie seems to improve upon a book, but in this case I think Field of Dreams managed to translate the story into something much more emotional and memorable. Writer W.P. Kinsella did things his way. In failing health, he chose to end his life early Friday afternoon.“W.P. (Bill) Kinsella invoked the assisted dying provisions of Bill C-14, at Hope, B.C., and passed away at 12:05 p.m. … Friday, Sept. 16, 2016,” said a statement from his agent, Carolyn Swayze. I don't remember when I first read this. Probably shortly after Field of Dreams came out. I loved that movie, and the book was damn good. Baseball, magic, love... someone or other called this a male romance novel, and they're not far off, really. Ray Kinsella is prompted by a Voice that comes from nowhere to build a baseball field in the middle of his farmland. Like most farmers, he's barely making it and can't really afford to lose the acreage. But he does it. Strange and wonderful things happen, bringing magic to a small corner of Iowa. Ray connects with a legendary author and gets some surprises about his own family. It's a great story that, if it doesn't touch you at all, I truly feel sorry for you. Who would have thought...the CUBS and the INDIANS in the World Series! Today is game 3 of the series with it tied one game apiece. The Cubs haven't won a World Series since 1908 and the Indians haven't won since 1948. This great matchup made me want to read a baseball novel and what better than SHOELESS JOE, the basis of the movie "Field of Dreams" starring Kevin Costner. I saw Dreams when it first came out in 1989 but I didn't really remember much about it other than the Costner character building a baseball diamond in his cornfield in Iowa where a ghostly team of Chicago White Sox end up playing. I have recorded the movie on my DVR and will be watching it again soon to see how it compares to the book.I've had the book on my shelf for several years, along with a few others by Kinsella, and I'm glad I finally got around to reading it. The main character, Ray Kinsella, does build a ball field outside his corn field on his Iowa farm because he heard a ballgame announcer tell him..."build it and he will come." And sure enough, once he is finished with left field, Shoeless Joe Jackson of the infamous 1919 Chicago Black Sox does appear and lets him know that the entire team will come when the ball field is complete. Then Ray hears the voice again advising him to seek out the Catcher in the Rye author, J.D. Salinger, and take him to a ballgame in Fenway Park. (In the movie, Salinger is changed to the fictional Terence Mann.) Salinger reluctantly agrees to go with him and winds up going back to Iowa to the ball field along with a young Moonlight Graham, who played only one inning for the New York Giants back in 1905.The novel is full of baseball trivia including details about the early Chicago Cubs (who last won the World series in 1908) and their players. One of the characters in the story, Eddie Scissons, claimed to be the oldest living Chicago Cub. Overall, I really enjoyed this fantasy about the love of the game and would recommend it to any baseball fan. This story is so inspiring and yet so down to earth and simple, it just seems too good to have been written. But it was, and the prose to describe the journey Ray takes because a voice told him to build "it" (a baseball field) is great. Definitely a five star read. Instead of a full review, I am saving some comments for the discussion on this book that will start October 1 in the Baseball Book Club. A "grand slam." (Don't groan too loudly!) An easy read (it was in the young adult section of my library) but the prose is really lovely. The story is similar to the movie that was based on it, Field of Dreams, but has more characters, who are all much more interesting. I learned about the Black Sox scandal and the class tensions behind it. Interesting!I highly recommend it. I'd offer to lend out my copy, but I don't own it. Haunting, spiritual, and written with such lovely, dedicatedly prosody, this is an Arthurian Quest, a history of the American spirit, and the story of cynicism and idealism, dream chasing and practicality, two halves of the same whole uniting in one perfect game. I've taught this book and read this book, and I've adored every minute of it. And I'm not even a fan of baseball. Once I learned this book was the basis for Field of Dreams, it went onto my tbr. Fast-forward fifteen years, I see my library has a copy. I grab it, I read it, life is good.This is one of those rare situations where I'd say the movie beats the book. I liked this, don't get me wrong, but the movie pared things down enough that it was a more focused, less diffuse experience. Also, some of the elements of the novel get a little... silly. Nothing book-breaking, but occasionally distracting.Also, anytime a writer creates a work of magical realism with themes of love, forgiveness, and faith and then sets that piece in Iowa, you know they're just begging for people to call it corny.Still, I'm a sucker for both baseball and magical realism, and sentimentality isn't some kind of disease to me, as it sometimes seems to be for others. So I dug it, and dug it heavy. Again, there are awkward and silly elements, but I was able to let them slide, open my mind and go with the flow. I hope you are willing and able to do the same. Shoeless Joe is the basis for Field of Dreams but is quite different than the movie. Kinsella masterfully created a fantasy that pays homage to baseball as a classic game that pulls people together over multiple generations. I especially loved the literary nature of Jerry in the story. Recommended for baseball fans who like literature or literature fans who can appreciate baseball. Of particular note, Kinsella's description of the love between Ray and Annie was perfect throughout the entire book. Wonderful book that is a high four star rating at perhaps 4.7 or 4.8. The most romantic novel I have ever read. Just finished this and needed to re-watch the movie Field of Dreams that it inspired. While the novel has some characters, themes, and events that some might feel are missing from the film, on the whole, the film is faithful to the spirit of the book and in some ways even improves upon it. This book is about the love of baseball, known for decades as the American Pastime. The book is also about the love of the land and this is one of the themes that gets trimmed. But the love of baseball is embellished upon. It's a love passed down from fathers to sons and while this man has only one daughter, its clear that that love is being taught to her as well. Finally, the book and the movie are about having the courage to fearlessly follow your dreams when you know that they're in the right.The novel clearly falls into the Magical Realism school and the movie makes that even more apparent. It's about the beauty of dreams and one man's quixotic mission to follow his dreams. The connections with baseball are perfect for this theme. Baseball is evocative of a simpler, more innocent time when even the villains could be heroes. Surprisingly the book is more modest than the movie in some of its plot points. The book's protagonist is a bit more of the everyman while the movie emphasizes the fabulous dreamer part of his character.It's a measure of the magic of film that the movie evokes the beauty of the ball diamond and the worshipful air of expectancy associated with a game under the lights without coming off as religious, while some of the passages in the book that attempt the same descriptions seem weirdly evangelical.Ray's twin brother, the old farmer Eddie Scissons and Annie's Brother Mark all receive less emphasis in the film but their absense was not too deeply felt. Not omitted, but considerably changed was the authors's fascination with reclusive writers. James Earl Jones does a credible job as the formerly activist writer Terrence Mann in the film but this fictional writer is a poor substitute for the original J.D.Salinger of the book. However it is nice to see a black man in this film that is firmly centered on pre-Jackie Robinson baseball.I'd recommend this to baseball fans, fans of dreamers, fans of writers and to fans of fathers and sons. This read is well worth the time. Not perfect -- but much better than the movie!! !I read this book when it first came out, as a young Marine in 1988. I found it to be MUCH better than the movie with Kevin Costner that came out shortly afterwards. The book is light, fun, playful, full of warmth but never takes itself too seriously. The movie is slow, dull, self-important and strangely inert, with a lot of dull, empty scenes and some strident Sixties posturing that has nothing to do with the book's exploration of baseball.When I look back now, I think the movie's problems have to do with bad casting as much as anything else. James Earl Jones is a titanic legend as an actor, but he's never been much of a comic talent. The fact that his character is supposed to be funny is something the movie fails to grasp. In the movie the writer is basically a dull, painfully uptight straight man -- and he's a straight man to Kevin Costner, who is a dreamy leading man but again, not exactly Groucho Marx in the humor department. In the book the hero is much more whimsical, and takes an almost playful attitude towards his impossible quest. The movie is painfully serious. In the book the hero adores his wife Annie, who is more sweet and loving rather than shrill and aggressive, which is how Amy Madigan plays her in the film. (Maybe she thought she was acting in another Biker stomp-movie, like STREETS OF FIRE. )This book is definitely fun, and enjoyable, and I would recommend it to anyone. One thing I didn't like was the way baseball is promoted constantly -- not as a fun pastime, or even a character-building sport, but literally as a substitute religion that will replace Christianity. Now no-one has more skepticism about religion than I do, but I don't think baseball can replace the Bible, any more baseball can replace ballet. Kinsella would have had a better book if he had limited the anti-religious theme, or at least acknowledged his own bias and let it go at that. Why do sports have such a hold on us? It's an interesting question, since sports stars today make millions of dollars and are often more influential than statesmen and scholars. Perhaps it's the idea that sports are really a metaphor of life. We all want to believe that we can work hard, have plenty of heart, and with those two things going for us we can conquer the world. That is the basic idea behind WP Kinsella's novel, "Shoeless Joe".This is the book upon which the 1980s movie "Field of Dreams" was based. If you liked the movie, you really should read this novel. But like any good novel, there is far more to this novel than what can adequately be covered in a movie. This novel is more a story about real life people than it is about athletes and sports stars. The people of this novel have dreams and ambitions that they never really fulfill. They look to the golden days of sports to make up for that feeling of non-fulfillment that perhaps they are not able to achieve in their real lives. And then, one day, the world of sports and their own world collide, and they discover that dreams are not nearly as unreachable as they had thought.Kinsella is an excellent writer and he crafts a story here with vivid characters and a profound plot. It's a shame that we don't hear more about Kinsella. What other novels has he written? Is he a one-hit wonder? I would really like to look up his other novels on Good Reads and see if they measure up to the excellent standard that he set with "Shoeless Joe".I would recommend this book to anyone who would like to read a good novel, and especially to those who are interested in the "Golden Age" of baseball. Occasionally, I actually like a movie adaptation better than the book. This is one of those times. It's not really fair since I happen to love the movie Field of Dreams and my opinion on the book is 100% biased because of that fact. The book had too many characters. I think removing the twin brother and switching the focus to a troubled father/son relationship was a smart move, as was removing the Eddie character. His baseball sermon was weird and out-of-place. Shoeless Joe is also more important in the movie and there seems to be more of a point to the story. In the book, the fact that it was happening to Ray didn't really seem to matter. It could just as easily have been any other baseball obsessed fan with enough land to accomodate a baseball field. Again, I grew up with the movie and I've seen it a million times in the last 28 years, so my book experience was tainted from the start. I liked the book just fine, though. I'm glad I read it. I'm always fascinated how movie adaptations change a story and this is one instance where I assume the author was satisfied. The major plot points are there and it has the same heart. I was delighted to find the author in the book was JD Salinger. I bet he just looooved that. Ha! 3.5 stars.First, I must confess my strong dislike for baseball. I find it so boring. But with that being said, I did actually like this book. It was so well written. The author's descriptive style was great and kept me interested throughout this whole book.The reason for the 3 stars and not 4, is only because it was kind of slow to start. I found the question "What have I got myself into?" floating around at the beginning. But once I fell into the pace of the rhythm and noticed the writing style, I followed willingly. The other thing that I didn't really love, was the play by play when Shoeless Joe and the others were playing the game. I was lost in that and wondering how to get out. This is a wonderful novel of magic and the mundane. Yes, it's the basis for Field of Dreams, but try to keep that out of your head while you read. You'll be surprised by how much of it you don't recognize.These characters are likeable, except when you aren't supposed to like them, and recognizable. Strange things happen to them, and they adjust much the way you would have to if strange things were happening to you. The actions they take don't make them change the people they are, they just draw them into focus.There's marvelous stuff here: carnivals, freak shows, twins who are so identical even they aren't sure which is which some of the time, trips across the country, long stretches on an Iowa farm, and baseball. There is always baseball.I love this novel. Some of you may, too. One of my favorite books, forever and for always. I think you have to really love baseball in all its historical glory to enjoy this book, but I've always loved the writing style. It still makes me shiver, even though I've read it at least three times. I thought it would be okay... but it's fantastic. One of those books to own and add to your collection, with such a great lyrical style, it's an amazing, beautiful book. A little heavy-handed on the baseball religion towards the end, but an awesome read. this books is amazing whether its your first time reading it or not. Doesn't matter if you've seen 'Field of Dreams' neither is better than the other. Both remind me of my love of baseball and its heroes.